About ten years ago, while learning HTML and practising the trade with a couple of websites, I had an idea. I called this idea "HyperLists" and I was sure it would take off. 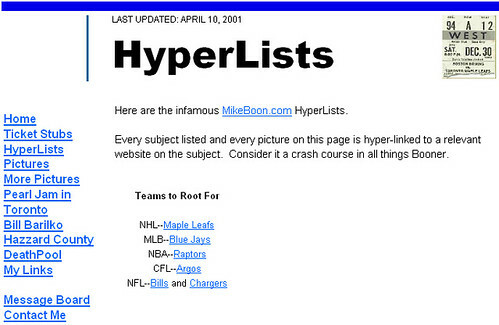 HyperLists were simply "Top 10" lists in which each item on the list linked to the most relevant site on the web. Ten years ago there was no Google, no Wikipedia and no blogs. We had search engines, but they weren't quite as relevant as they are today. HyperLists weren't just interesting and fun (everyone loves lists!) but they served a purpose and I thought they'd make for a very interesting site. I gave up on HyperLists around the time I changed this site into a blog about 7 years ago. There's very little evidence of my early efforts left on the web, but thanks to the Internet Archive, you can see a sample HyperLists page from early 2001. Not everything got archived correctly, the page's images didn't make it, but that's a taste of what could have been the next big web sensation.